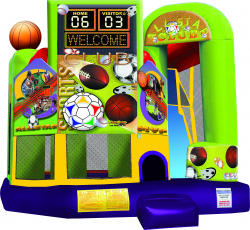 For all those boys and girls who love sports this bounce house combo is the perfect way to combine fun and healthy activity. The Backyard Sports Combo features a bouncing area, basketball hoop with ball, and a fun slide that you can only get to by climbing! This exciting unit will add FUN and value to any party, either inside or outside. With a variety of entertaining activities this bounce offers kids of all ages exciting aerobic activity. This jumper has mesh windows, so parents and spectators can have a clear view of all the fun. Price: $245.00 per 7 / hrs. Price: $245.00 per 3 / hrs. Price: $245.00 per 4 / hrs.